At nightfall tonight (July 24), look about just above the west-southwest horizon, about the width of your clenched fist held at arm’s length, and you’ll see a wide crescent moon, weather permitting. Hovering above and to its right will be a moderately bright, yellow-orange "star." But that’s no star – rather, it's the planet Mars. And it might be difficult to believe that it's the same object that more than four months ago was shining nine times brighter than it will be tonight. That's because Mars continues to recede from Earth, as viewed from the surface, and consequently continues to fade. Currently, Mars is 147 million miles (238 million kilometers) away and shines at exactly first magnitude. On the list of the 21 brightest lights in the sky, Mars would currently rank 18th. That's quite a drop from early March when Mars shone with brilliance just a trifle less than Sirius, the brightest star in the night sky. The Moon, two planets (Mars and Saturn), and the bright star Spica shine together on July 24, 2012 in a promising quadruple conjunction. In terms of apparent size, the disk of Mars is downright tiny — only a large amateur telescope is likely to show any dusky markings on it. At least we have a spacecraft heading for the Red Planet that is rapidly drawing near! NASA's Mars Science Laboratory, launched on Nov. 26, 2011, is carrying the 1-ton Curiosity rover toward the Red Planet. The rover is due to land late Aug. 5 PDT (early Aug. 6 EDT) to begin a two-year prime mission. Curiosity's landing site is near the base of a mountain inside Gale Crater, near the Martian equator. Scientists hope Curiosity will help determine whether Mars could have ever been habitable for primitive life. But while discoveries from the Mars rover Curiosity must wait until after the spacecraft's arrival, the planet itself can still inspire observers gazing at it in Earth's night sky. The gap separating Earth's moon from Mars tonight will be equivalent to about 5 1/2-degrees, which is the same as the distance that separates the Pointer Stars (Dubhe and Merak) at the end of the bowl of the Big Dipper, which point the way to Polaris, the North Star. The orbit of Mars, like that of Venus, has a resonance with that of the planets' sister Earth, though a less simple one: in the time for Earth to go around the sun 79 times, Mars goes around almost exactly 42 times. So right now, Mars is repeating its behavior of 79 years ago, in 1933. But there's a catch: One thing that is always unique is the pattern of its conjunctions with the moving array of other planets in the night sky. Mars is usually involved in many more conjunctions than are the more distant planets because its long trip around our sky carries it in front of them. Currently, Mars is positioned against the dim stars of western constellation Virgo. 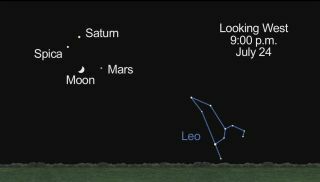 The Red Planet is on its way toward a mid-August rendezvous with the planet Saturn and the bluish star Spica. In 1933, Mars had a conjunction with Spica, but not Saturn, because in that year the ringed world was residing in the constellation of Capricornus, the Sea Goat. Take a good look at where Mars is right now, about 10 degrees (or one fist-length) to the lower right of Saturn and Spica. It will take another three weeks for Mars to reach them. It's a different story, however, for Earth's moon, which is about 640 times closer to Earth than Mars is. The moon will reach Saturn and Spica on Wednesday night (July 25), so don't forget to look up then, too! Editor's note: If you snap an amazing photo of Mars and the moon that you'd like to share for a possible story or image gallery, send images and comments to managing editor Tariq Malik at tmalik@space.com. This story was corrected to reflect the proper date (July 24) of the Mars-moon night sky sight.